Vanson was the first company to develop large format perforating for entire panels of leather, and to incorporate perforated leather in entire garment sections. The trick was to incorporate perforations without compromising the strength of the leather, creating a material that would allow maximum air flow, and still be usable in racing suits and street wear. Vanson’s Avenger Vent system (U.S. Patent #5752277) provides the largest controllable vent area of any motorcycle jacket on the market today. This elegantly simple yet effective system features two front panels that fold down to expose perforated leather panels behind them This innovative cooling method is different from other venting systems in that it prevents the jacket from ballooning as the vents are opened – ensuring uninterrupted comfort and mobility. To see examples of Vanson’s Avenger Vent system, go to vansonleathers.com/SearchResult.aspx?KeyWords=avenger%20vent. Vanson’s Air Curtain Vent (U.S. Patents #5507042, 6883178, 6868557) features a perforated jacket front, with an airtight membrane behind it, that has zip-down panels folding into special pockets to allow air to flow through the jacket and out the rear vents. Unlike our Avenger Vent system, the Air Curtain Vent system’s inside vents allow for graphics to be applied to the front of the jacket. And, as with the Avenger, ventilation is controlled by opening or closing the interior panels for optimum comfort under varying conditions. The Air Curtain Vent system will not balloon when the vents are open. To see examples of Vanson’s Air Curtain Vent system, go to vansonleathers.com/SearchResult.aspx?KeyWords=cobra. Vanson’s Air Induction Ram system (U.S. Patent #5704064) is analogous to our Avenger Vent and Air Curtain Vent systems. By backing the open vent with a material of fixed circumference, the sleeves or legs won’t billow and the armor and protection areas won’t shift out of position. Our Air Induction Ram system consists of a zipper on each sleeve inseam at the elbow. Cooling airflow is fully adjustable by opening or closing the zippers. Air enters the sleeves through the perforated leather behind each open zipper and flows up a channel directly to the armpit – cooling the rider by carrying heat away through the exit vents. To see examples of Vanson’s innovative Air Induction Ram system, go to vansonleathers.com/COB2. The Vanson Adjustable Ventilation system (U.S. Patent # 6795976), which can be built in to pockets, allows the pocket to work both as a pocket and as a variable vent. When the vent is closed the pocket looks like a normal patch cargo pocket. When the vent is open the pocket function is kept while air is allowed to flow in. Our Floating Armor System (U.S. Patents #607274, 6260196) was developed to allow Vanson jackets to have a snug fit, which is important for holding the armor in the correct position relative to the rider's body. Often a sleeve, knee or shoulder has to be expanded to allow armor to fit, and because the outer shell of the garment is then too big, the armor and padding can shift during impact and no longer be where it is needed. In a worst-case scenario, the outer shell is so big that it can fold up, catch and tear during impact. On the other hand, if the outer shell is tight enough to hold the armor in position it will often feel uncomfortable and even bind when the rider moves. Our solution is to mount the armor using a Velcro and elastic harness that keeps the outer shell snug, while allowing the armor to shift as the rider moves. More Comfort = Less fatigue = Greater Concentration = More Confidence = Greater Safety. Twin Zipper Fronts (U.S. Patents #6070274, 6854130) give a suit with less bulk, by allowing fit to be introduced into the front panels. Vanson was the first to use two zippers on the fronts of Racing Suits, allowing the front to be slightly concave (like a forward-facing cupped hand), so reducing bulk when the rider is leaning forward. Zippers can be pretty stiff when leaning forwards – by moving the zippers away from the centerline this resistance is avoided. We can now use the very strong #9 zippers which would otherwise not be comfortable when in the riding position, and the zipper teeth are now no longer pointed directly at the rider's throat. In order to build the outer shell of a garment one needs to be able to turn the sleeve or legs inside out and back again during assembly. If hard, non-flexible armor is incorporated into the outer shell, it is impossible to invert the sleeves or legs. 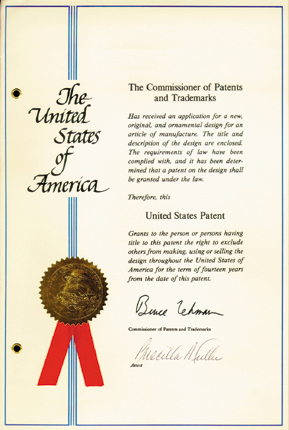 Our solution (U.S. Patent #6854130) is to make the sleeves and legs in two assemblies that both zip closed. In this way the armor may be fitted as needed during construction and there is no need to turn the part inside-out since the closure is given by the zipper. Using perforated leather in the inner sleeve and a multi-head zipper in the outer sleeve gives controllable, variable ventilation.